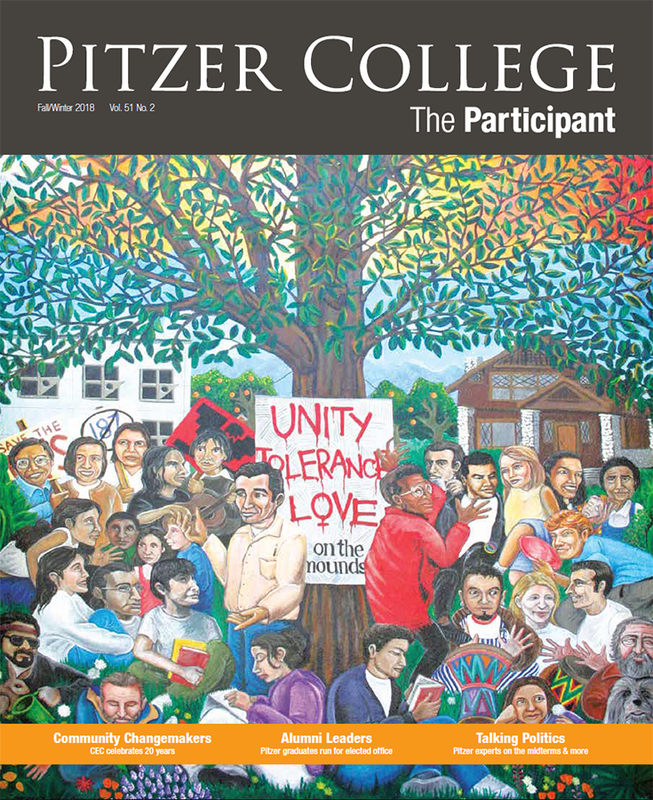 This article first appeared in Pitzer College’s alumni magazine, The Participant. Read the full fall/winter edition online. Jenessa Flores Parker ’10 knows that not every child’s early exposure to education is positive. She also realizes how much this matters. As an urban fellow for Pitzer College’s Community Engagement Center (CEC), she spoke with young men at Camp Afflerbaugh-Paige, a Los Angeles County juvenile detention center and CEC partner organization. Many had disliked their school experience from the start. Now Flores Parker is the Pitzer College site director for Jumpstart, a national nonprofit organization and CEC community partner that prepares young children from low-income neighborhoods for academic success. She and Pitzer students team with Jumpstart sites at local Easter Seals Child Development Centers to create a positive learning environment for preschoolers. The experience has made a bigger impact on Flores Parker than any other, and she is certain the Pitzer students feel the same. Producing positive change through community collaborations has always been the motivating force behind the CEC, from its founding 20 years ago by faculty members Alan Jones and Lourdes Arguelles to today under the leadership of Associate Professor of Urban Studies and Assistant Vice President of Community Engagement Tessa Hicks Peterson. That idea became the Pitzer in Ontario program, with Jones as director. But he and Arguelles saw a need for something more. The result, in 1998, was the Center for California Cultural and Social Issues (CCCSI), which later became the CEC. Designed in consultation with community partners, the CCCSI incorporated five-year plans and provided a framework for the program’s evolution. “The student faces might change, but what was expected of us was laid out. It was good for our partners because nonprofits operating on a shoestring rarely get to do strategic planning,” says Jones, who became the CCCSI director. The Pitzer in Ontario (PIO) program, like CEC, is celebrating its 20th anniversary this year. Two decades ago, PIO created a program that immersed students in local social change movements through a set of core courses, critical community studies and research methodology, including a 150-hour practicum with local organizations. 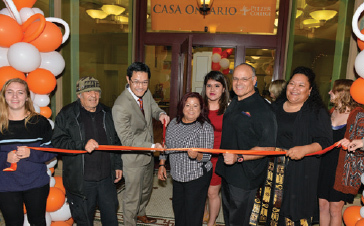 Recently renamed CASA Pitzer, the program is now housed in a historic building in the heart of downtown Ontario. At CASA Pitzer, local nonprofit agencies share space with students to create a hub for academic programs, community action and social advocacy. Pitzer was ideally suited to this approach to community engagement: Social responsibility, student engagement and intercultural understanding are among its core values. With this mindset, viewing community organizations as collaborators and co-educators came naturally. Since then, courses in the theory and practice of social responsibility and social justice have become a student graduation requirement. The College also made community engagement recognized in faculty promotion and tenure decisions. Community engagement staffing increased when urban fellow positions were created to enable Pitzer students to work full-time at partner sites after graduation. It also changed, with Jones transitioning from CCCSI director to dean of faculty. Today’s CEC is still part of Pitzer’s academic enterprise. This helps in fulfilling the CEC’s mission to support faculty, students, staff and partner organizations advancing social responsibility and community engagement through research, service, advocacy and action. Professor of Psychology Mita Banerjee connected theory to practice when she created opportunities for students in her Child Development course to work with at-risk children through Prototypes Women’s Center, local schools and other community organizations. 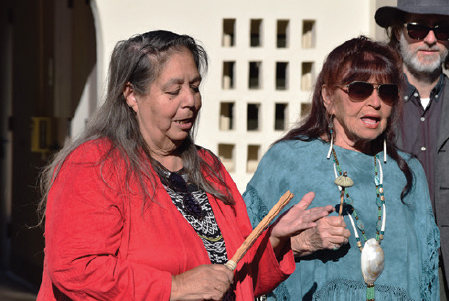 Bogany has now worked with CEC’s Native Initiatives program for a dozen years, creating engagement opportunities for Pitzer students, faculty, staff and local Native American communities. She says these interactions foster mutual learning as well as collective action. The CEC has worked for many years with core partners Camp Afflerbaugh-Paige, Prototypes Women’s Center, the Pomona Economic Opportunity Center for day laborers, Jumpstart and a variety of Native American programs. The Center also provides funding to support student participation in community-based projects and for faculty to incorporate community-based speakers and course materials in their classes. This year CEC also sponsored the Pitzer–Girls Fly! Global Intergenerational Women’s Leadership Conference, awarded fellowships and summer internships, and recognized students for their academic and community engagement. Hicks Peterson emphasizes that the Center is far from the only force on campus pushing for social change and service learning. She cites the many faculty-led community engagement efforts that fall outside CEC’s direct purview, such as Professor Paul Faulstich’s work with the Leadership in Environmental Education Partnership, Professor Ethel Jorge’s creation of the Community-Based Spanish Practicum and Professor Kathleen Yep’s collaboration with Literacy for All of Monterey Park. Collectively, all these programs create opportunities for students to learn about critical issues in “rigorous, intellectually challenging ways,” Hicks Peterson says. The CEC is changing as well. Reflecting on how to build on the first 20 years, Hicks Peterson and Morgan realized the CEC provided more direct service than originally envisioned. Meanwhile, assessments revealed faculty and students could be better equipped for community engagement. “Our core partnerships created a reliance on our ability to provide service. But our work aims to go beyond service to collective changemaking. We’re bridges, allies and engaged participants,” says Hicks Peterson. Now CEC is focusing on developing communities of practice, training students and faculty, and providing online resources. It is shifting from a model centered on a few core partners to one that incorporates more academic disciplines and five broad themes: immigration and labor; health and environment; arts and culture; education and mentoring; and incarceration, re-entry and recovery. This article originally appeared in the 2018 Fall/Winter edition of The Participant.